This was too interesting not to post……….Gardners are saying, "What the heck"? So the short verson is……………. The Miracle Tree Octopus F1 grows to 13 feet (4meter) and above and is grown for 1.2-1.5 years. 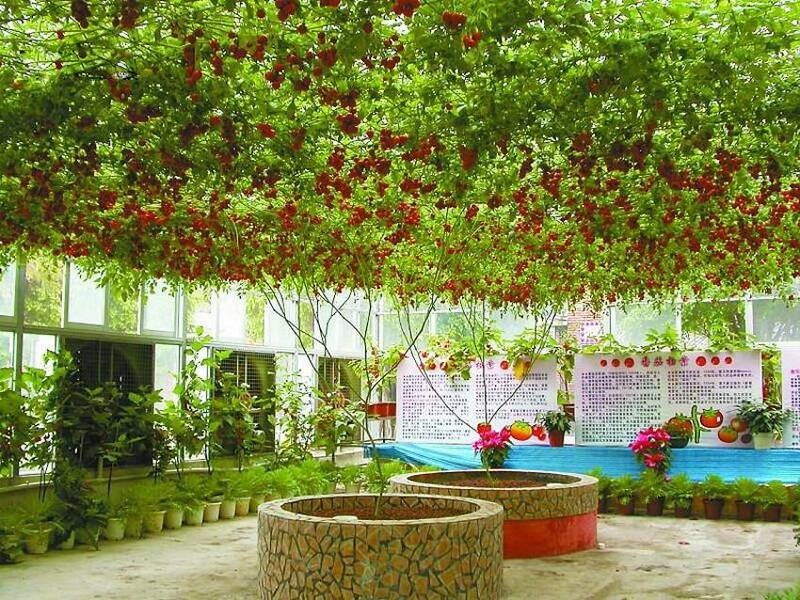 In the first 7-8 months, the plants do not give fruit to form a tomato tree. The rest of the time – a period of fruit formation and fruiting. 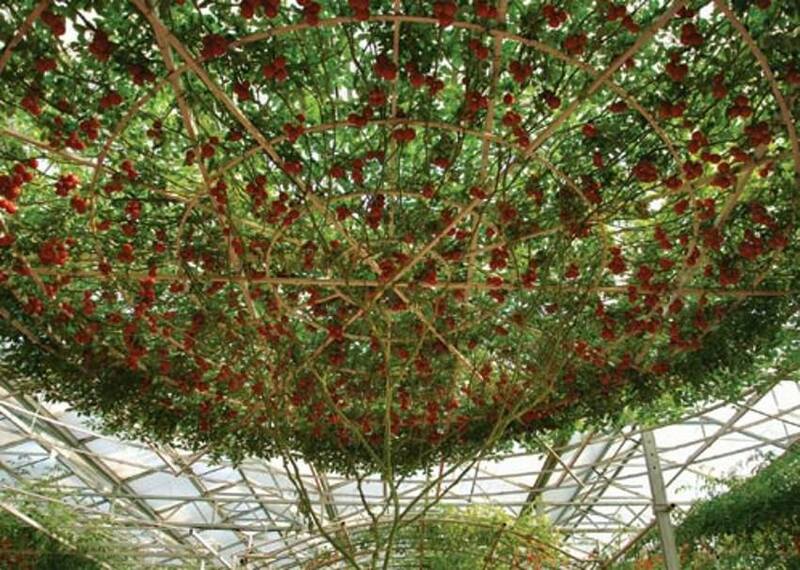 Square crown of tomato F1 Octopus is 40-50 square meters. 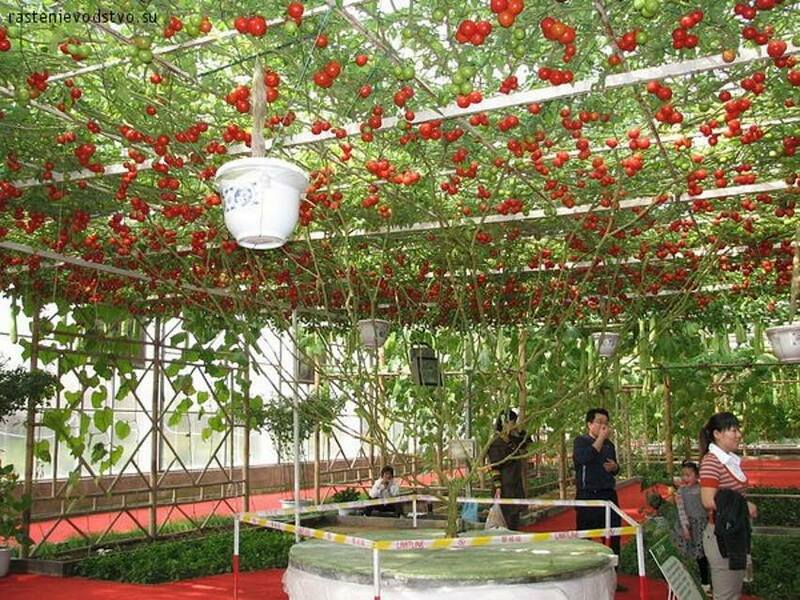 Record harvest – 14 000 tomatoes, weighing 1500 kg (3000 lbs.). It is normally held up by a large trellis. The plant is hybrid, I'm not sure yet when they were first created, I'll look more into that and update the post. The first set of seeds from the cross pollination are known as an F1 hybrid. F1 indicates that it is the direct offspring of the original cross. Once those plants produce fruit, the seeds can be harvested and replanted. An heirloom tomato is one that is an established variety that has been grown for many years. But keep in mind, no variety is ‘the original’. Many heirloom varieties have originated from various countries where they have been separated from other types and growers have saved seeds from desirable fruit. A hybrid is NOT the same as a GMO. A hybrid is created when the pollen of one variety is used to pollinate the stamen of a different variety. While some varieties of heirlooms were derived by growers keeping only the seeds from their favorite plants, other heirlooms began as hybrids. Once a hybrid is stabilized, it is no longer considered a hybrid and in future generations, it will be considered an heirloom. Hybrids are insect or gardener cross-pollinated. Hybrids are no different than what happens in nature. Bees introduce pollen from one plant to the other. My Note: This post is just something I'm shooting out there about an interesting plant growers might wanna take a look at, that "seems" to not be GMO. Growers might wanna take a peek at it, but do your own homework. The source of the comments above seems to make sense, although on his page he "kinda" feels there is no proof of GMO's being harmful to human health, I think the total opposite. I'm from the camp that just because I disagree with one statement the source makes, that doesn't mean everything he says is not valid. If I had the means and need to grow this plant, I would be comfortable growing it (though I have no need for 1.5 tons of tomatoes)…..if anyone needs my opinion on that. However, my hometown of Seattle is starting its own free public food forest, and I'm sure they would want to take a look something like this. Just writing all this because people love to "write and fight" and argue over the web about "this or that", that's not my thing, all I'm doing is saying "here's something gardeners might find interesting"……nothing else. Thank you so much for your article ! I have lived in the middle of Mexico for the past 45 years. Now that I am retired I dedicate my time to volunteering at an agracultural university for underprivliged farming community in the State of Guanajuato. I smuggled in seeds of Moringa Olifera to teach how to grow a vertical forrage crop with little water and we now have 360 producing trees on a piece of my land that are producing seed for the students. The small family farms are going under for lack of water and cost of water when there is some. I am trying to teach them to grow crops that are different so they can look for better markets and not loose their farms. Would you know where I could get a packet of seeds for this lovely plant ? I have shown them how to build uncostly hoop houses to be able to quick start crops and to grow the Moringa trees, we could do the same for these tomato trees. 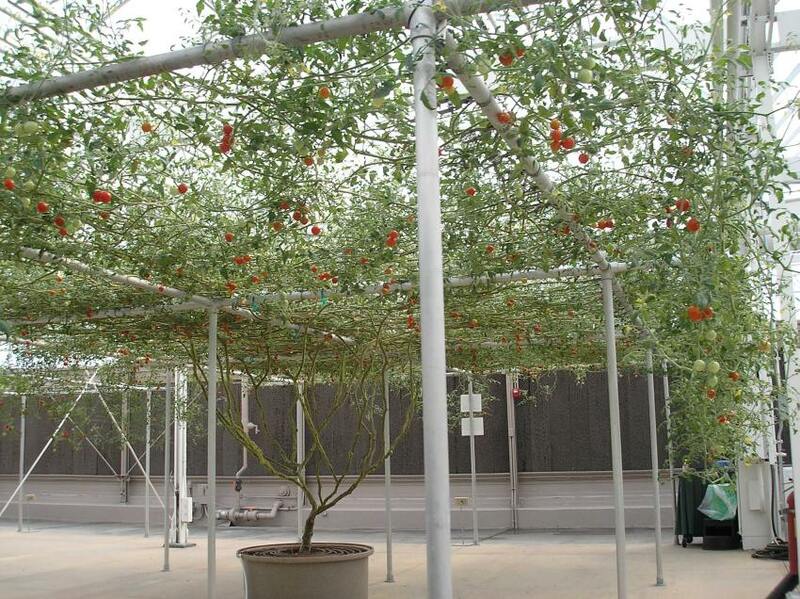 Would brain storm how to make inexpensive trellises to support them. Just found your info and need to look deeper – but if you could help with how to get some seed it would be a huge help. Thank You. Helping the world one farmer at a time. Thanks for commenting on my article. I actually didn’t find out much more detail on this plant. You might want to inquire at the first link at the bottom of the article. I’m not sure if that is the guy who planted it, but he seem to have more in depth knowledge. Also, you have an interesting story about “smuggling seeds” and gardening and farming in Mexico, and educating people and so forth. Very intrigueing. You should allow me to write an article on your experiences in my “Sustainable Gardening, Eating and Living” section of my blog, in that I am trying to build up that Blog section. 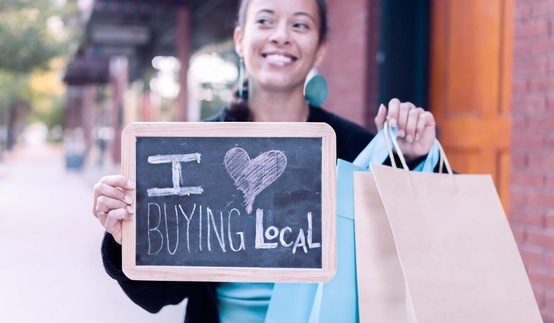 check out the link here in case you haven’t got to look at my Sustainable blog section articles yet. octopus tomato f1 in India…. where can i get the F1 seeds? I honestly don’t know where to get the seeds. If it were me, I would have to search the web to find someone who is actually growing the plant an ask them for seeds. Here in Denmark if you buy tomato seeds or plants they are usually F1. However over the last two years I have taken seeds from the tomatoes we have had and made plants myself. Almost every seed I had “made” myself turned into plants (last summer we I had over 50 and gave a lot away, where the ones I had bought the years before only 2 or 3 became plants. I have had good experiences with the tomato San Manzano, Plum Tomatoes, yellow cherry tomatoes, red cherry tomatoes and some other ones I don’t know the names of. But they all need a lot of water, sun but also shelter. However I know that there are types you can grow freeland, but I don’t have my book right now. Where can I buy seeds or plants of octupus tomatoes. To be honest I don’t know, I am not sure if they are being sold commercially. Sorry I can’t be of more help…….. Please guys bring the octopus plant to South Africa, I will really enjoy to try it in my research work. Thankyou so much for sharing your knowledge. I am desperately searching for these seeds and will definitely find it soon and share it with you all. Unfortunately, I know only as much about this tree as I wrote in the article. If you can read the other comments, it is apparent other people are trying to find out information about seeds and such. Of course, by posting message like yours, maybe you may luck out and someone may respond and give you the information you need. WOW! 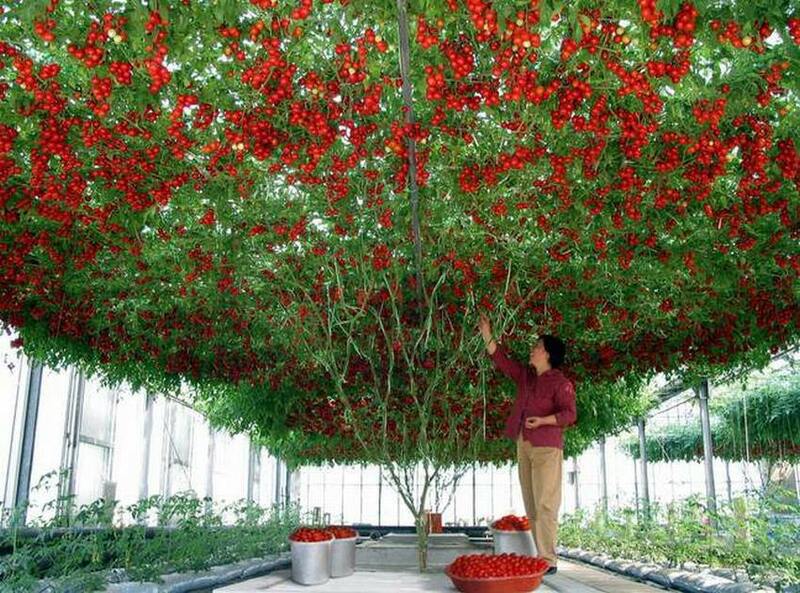 Tomato Tree. Really interesting. I am looking for this kind of tomato seed for my firm. where can I get this tomato tree seeds? please help me. Thanks. I’m really not sure where to get the seeds. I only know as much as I put in the article. Hopefully someone who knows will read all these questions about getting seeds and write me back. 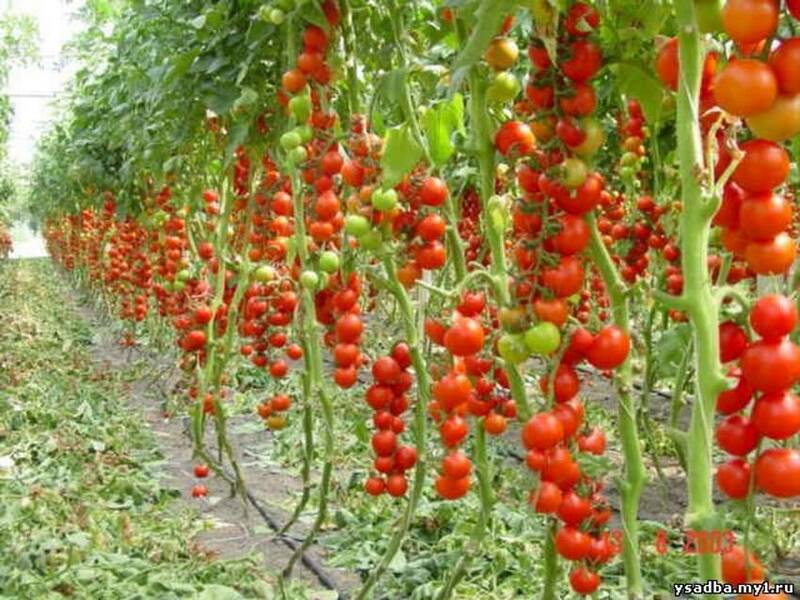 I found your article on octopus tomatoes very interesting and will like to know how I can get its seed/ seedline because I want to cultivate it.